We’ve been spending our mornings at the beach here in Pola. Today, our friend H graciously let us use his beach house. It was a short walk from our house in the town proper. When we were kids, we had to take a short boat ride to get to the beach in Kabilang Ibayo. But now, there is a bridge that connects it to the town proper. It was a glorious, sunny day. Perfect beach weather. I only wish we could stay here longer. 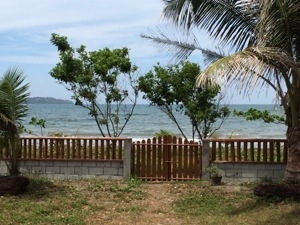 This entry was posted in Family, Grateful Project, Vacation and tagged Grateful Project, Kabilang Ibayo, Pola. Bookmark the permalink.